Traditional portrait photography studio lighting setups require at least three light sources, and in some cases four lighting sources. However, this type of portrait lighting is not always practical. In a home photography studio, for example, there may not be enough room for traditional lighting. In addition, shooting portraits on location can require the photographer to travel without bringing along all the usual lights. Fortunately, portrait lighting can be simplified for most situations. In traditional portrait lighting, the array of lights serves several purposes. The key light, or main light, as the name suggests, provides the primary illumination of the subject. This light is positioned in front of the subject and off to one side. The second light, called the fill light is not as bright and set up opposite the key light. A third light is used to illuminate the background. The purpose of these lights are, respectively, to provide the proper exposure of the subject, to eliminate harsh shadows on the subject’s face, and to eliminate the shadow of the subject from appearing on the background. If these three needs can be met with simpler lighting techniques, then you can produce a quality portrait with fewer lights. The easiest portrait lighting technique is to use the available light. A properly placed window or a cooperative sky can do the job as long as the subject is posed for a portrait in a way that compliments the lighting. The number one thing to avoid when shooting a portrait is to illuminate the subject with the pop-up flash, which can cause harsh glare, dark shadows on the face, and unflattering color. Turning off the built-in flash is therefore the first step. In order to properly expose the portrait then, a slower shutter speed may be required, which can produce a blurry portrait. Therefore, the second step for simplified portrait lighting is not lighting at all, but rather putting the camera on a tripod to eliminate any camera shake. It may be necessary to use a manual mode like aperture priority to get some digital cameras to make the right exposure decisions. Assuming a fast enough lens and a good digital camera for portraits, this may be all that is required to get great shots. The real world isn’t always so cooperative. However, a simplified lighting solution can still work in many cases. A single light placed in the traditional key light position can be used with a reflector in the position of the usual fill light. 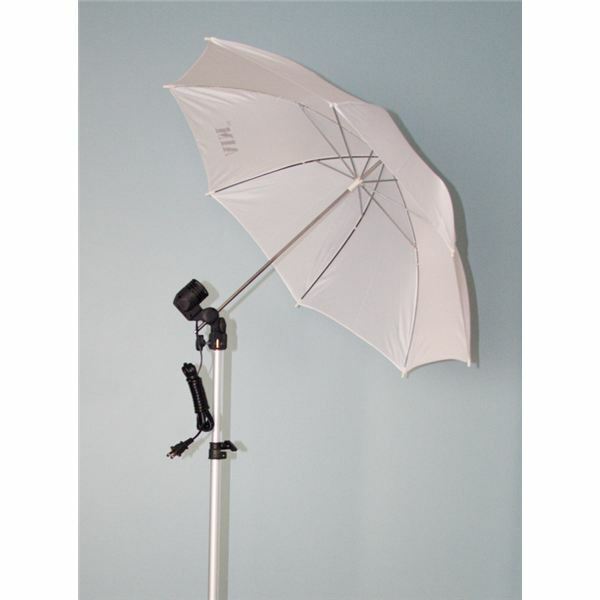 This setup provides proper exposure from the main light and the reflected light prevents dark shadows being cast by the subject’s nose or other facial features. Another possibility is to try and make the key light less harsh using an umbrella or softbox. All that is left is to prevent any shadow from appearing in the background of the portrait. To avoid a shadow behind the subject, you can either move the subject further away from the background or increase the angle of the light. In a large room, it is best to move the subject out from the background. The further away from the background, the lower the subject’s shadow will be. For a portrait focused on the head and face, only a small amount of separation may be necessary. Remember, there is no need to eliminate the shadow altogether, merely to relocate it out of the frame. If the subject cannot be moved a suitable distance from the background, then the shadow can be eliminated by increasing the angle at which the main light is to the subject’s face. Doing so throws the shadow further and further to the subject’s side until a composition can be created in which there is no shadow in the shot. Unfortunately, increasing the angle increases the intensity of light required from the fill light, so a tradeoff exists. While a built-in popup style flash is generally undesirable for portraits, an adjustable flash may very useful for simplifying portrait lighting. Using a single light source like a window or photography light along with a camera flash bounced off of a suitable ceiling can produce wonderful portraits as well. The bounced flash helps both to reduce shadows on the face and background. Take several test shots with a digital camera to find the proper distance for the primary lighting to be best complimented by a bounce flash. When shoot portraits outside, the flash can be used as the fill light to combat any shadows or harsh colors caused by the sun. Experiment with both distance and flash power settings to get just the right combination of sunlight and fill flash for perfect portraits outdoors. Image courtesy of ArcticLlama Freelance Writing Professionals.